Efforts to standardize the approach to trauma have led to an algorithmic, thoughtless approach to trauma that over-utilizes CT in well patients and delays CT in ill patients. In critically injured blunt trauma patients, CT is a fantastically useful test and should be prioritized as the critical diagnostic step to be taken as quickly as feasible. Classic teaching is that unstable patients should be stabilized prior to CT, but this is an outdated, dangerous paradigm; optimal care in severe trauma rapidly implements key resuscitative maneuvers so that resuscitation can continue simultaneously with CT. I have witnessed many cases where persistently hypotensive patients were observed in the trauma bay because “the patient might need to go direct to the OR,” but direct to the OR means direct to the OR; observation of an unstable trauma patient prior to elucidation of the injuries is usually the wrong strategy. 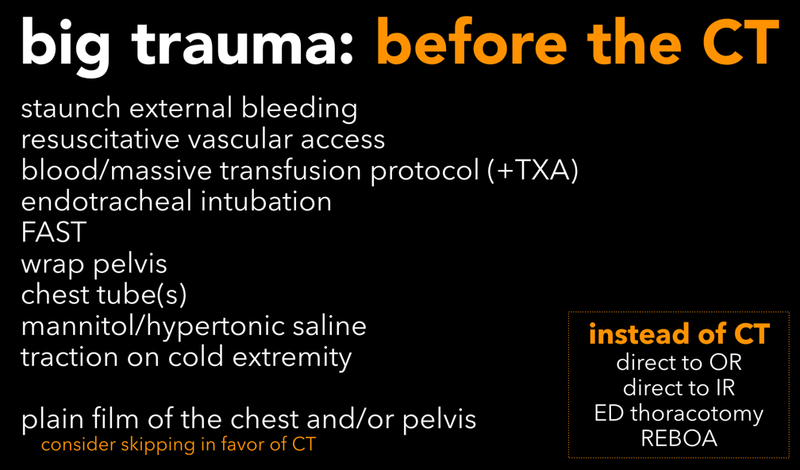 Know exactly what the initial resuscitative priorities are in trauma so that as soon as they’re done, the patient can be taken to their next destination (CT, OR, IR). The following are carried out in parallel with universal first steps of resuscitation and the primary survey. 1. Staunch external bleeding. This can be accomplished with pinpoint pressure in almost all cases, occasionally a proximal tourniquet is required. 2. Resuscitative vascular access. Short, wide peripheral lines or a sheath introducer in a central vein is an immediate priority. Know the flow rates of commonly used catheters. 3. Blood. Do not delay initiation of your massive transfusion protocol in the unstable trauma patient when ongoing internal bleeding is likely. These patients should also receive tranexamic acid or other procoagulants/reversal agents if applicable. 4. Intubate. Nearly all critically injured trauma patients should be intubated expeditiously. Do a quick neuro exam first if possible. 5. FAST. Point of care ultrasound in trauma was devised for critically injured patients, but in most trauma centers is now done on everyone, slowly and methodically, as if we’re evaluating the gall bladder in an abdominal pain patient. Slow and methodical is fine when the patient is fine, but in the unstable trauma patient, ask the junior resident to step aside so that an experienced sonographer can answer several crucial questions in 30 seconds: First, does the patient have a pericardial effusion or an underfilled heart; second, is there a pneumothorax. third, is there free fluid in the abdomen or thorax. 6. Wrap pelvis. In blunt trauma, if the patient is demonstrating exsanguinating hemorrhage, don’t push on the pelvis, don’t wait for an xray, wrap the pelvis straightaway. This will have the additional beneficial effect of discouraging anyone from doing a rectal exam. 7. Chest tubes. Ultrasound can generally tell you which hemithorax requires a chest tube or finger thoracostomy but if you’re not sure and are managing an unstable trauma patient with evidence of thoracic injury, do not hesitate to place two chest tubes. The sicker the patient with chest trauma, the more likely you should place two chest tubes. 8. If the patient has head trauma and evidence of increased ICP, start hyperosmolar therapy. 9. Non-exsanguinating extremity injuries generally deserve a damn good ignoring during the resuscitation of a sick trauma patient, but while the brain and thorax are being tended to, if you have an extra set of hands it’s reasonable to bring a cold limb out to length. Do not delay life-saving maneuvers (which include CT) for a foot or hand which will be of no use to your patient if they don’t survive. 10. Plain films. ATLS has us doing an xray of the chest and pelvis on everyone. These are good tests but CT is a much better test, and in the patient clearly requiring whole body CT, plain films serve mainly to delay CT. The chest xray tells you whether to place chest tubes, which you can determine by ultrasound or just do empirically, and the chest xray tells you if the endotracheal tube is in the right place, which you can determine by physical exam (or ultrasound)–in a well saturated patient, the exact location of the tip of the ETT can wait for CT. The pelvis xray tells you whether you should wrap the pelvis, which should be done empirically when history and physical suggest it. In the dying patient being considered for therapeutic angiography instead of the operating room, if the ultrasound shows no culprit and chest tube output is low, it’s the pelvis. If your interventional radiologist won’t take the patient until an AP pelvis is done, do an AP pelvis. Once the patient is intubated, resuscitative vascular access is achieved, and blood products are being transfused through a warming rapid infuser, resuscitation can be continued unabated in CT. In a critically injured poly-trauma patient, once these initial resuscitation maneuvers are in place, the options are CT, OR or an OR alternative. Continuing resuscitation in the trauma bay when it could be continued in CT amounts to observation, which is the wrong move in most cases. It is sometimes hard to know who can make it through CT and who needs the OR immediately–it’s a complex decision and you will sometimes be wrong, but in the dying trauma patient, if you choose to stay and play in the trauma bay you will usually be wrong. Commence resuscitation and, as a team, make a decision: CT, OR, or OR alternative. CT on the way to OR can be an excellent plan; the time it takes to get the patient to the OR and get everyone in position to operate is often all the time a radiologist needs to determine the most important life threats. In summary: CT is an invaluable test in critically injured trauma patients and should be delayed only for a few key resuscitative maneuvers. Know what they are so you can get them done quickly, and so you can defer anything less likely to help the patient than CT.
thanks to CH, AS, and KS for their review.